Listed on www.hostelworld.com one of the best parties in Europe. Join Malta’s famous boat party on the wonderful turkish gulet “Fernandes 2.” Spend the evening with over 200 other fun seekers and drink from a full open bar! Music by the onboard DJ, and enjoy a moonlight swim . Experience the best of Malta’s vibrant night scene on the Fernandes 2. This Lazy Pirate Boat Party will be a night to remember! The boat departs from Sliema at 7 pm and cruises towards the Maltese coast and the setting sun. You’ll be in the at our anchor point as night falls and the music gets louder! Stop for a swim for around 2 hours and take time for a moonlight dip. 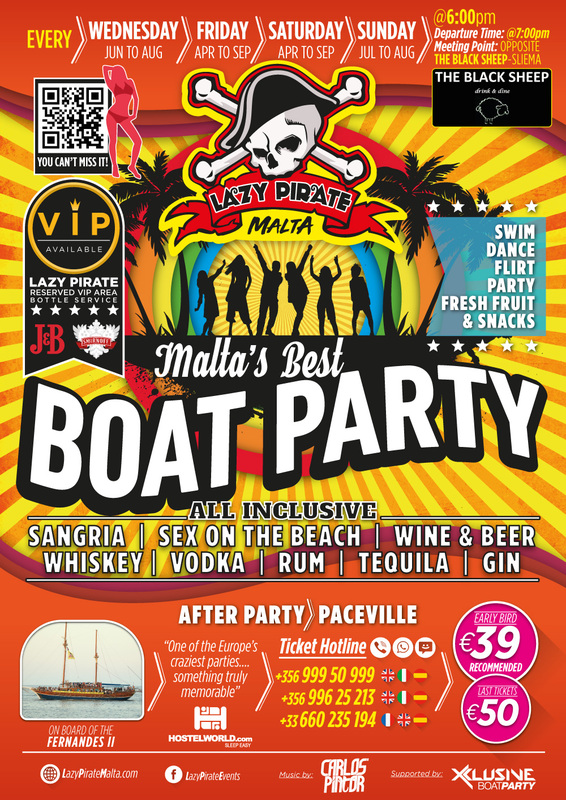 Party on until the boat returns to Sliema at around midnight.Throughout the party you’ll drink from an open bar stocked with vodka, gin, tequila, whiskey, rum, beer, wine, and softdrinks. Drink as much as you like and enjoy the complimentary snacks and fruit.